Imagine going through the normal bedtime routine, when suddenly, the calmness of your home is shattered by a forcible intrusion! What will you do? How will you react? What about your family members? Do you even have a plan? The cost of the seminar is $30.00 per person ($25.00 for Kick Masters affiliated students and/or family members), and no equipment or special clothing is required. The seminar is taught by Kick Masters Black Belt and Self-defense/Krav Maga Expert, Mr. Kirk McTaggart. Let Kick Masters Karate help you make a plan that will work! 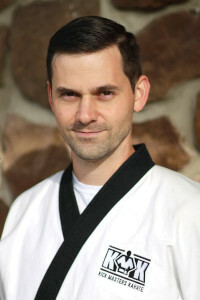 Mr. Kirk McTaggart is a Black Belt Instructor and Adult Self-Defense/Krav Maga Specialist at Kick Masters Karate. He has trained with Mr. Ernie Kirk of Krav Maga Universal in the specific area of Home Invasion Defense and Personal Protection. In addition to his extensive martial arts expertise, McTaggart has over 25-years experience as a law enforcement officer in the local and metro areas.